In this chapter, we’ll discuss the importance of your blog, sustainable blogging techniques and how your blog can become an important part of your company – beyond just branding and marketing. INTRODUCTION: How necessary is a blog? Many business developers feel that the idea of blogging is overblown and a waste of time and resources. And many companies still find that traditional sales and marketing avenues (trade shows, networking, cold calls…) provide the ROI that they’re looking for. But, I can’t think of any of these businesses that wouldn’t benefit from blogging – as long as they were to do it well. At a minimum, a blog can serve as your main source of SEO (search engine optimizing) and a repository of important data that potential customers can use to gauge their level of trust and interest in your products or services. Over the past few years there has been considerable emphasis on social media. Many people have gotten on board this train and have declared websites and blogs dead. 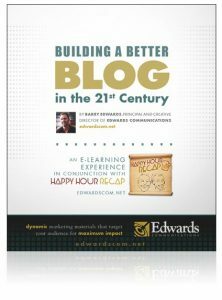 At Edwards Communications our blog is a vital part of our content marketing efforts. But our content marketing efforts are centered around our website/blog. And for some very important reasons. In fact, socialmediaexaminer.com lists blogging above all social media as being influential in online buying decisions. • Our content marketing efforts require a lot of time and effort and social media content is largely temporary, here-today-gone-tomorrow information. • Relying on third party platforms is relying on “rented” property. Any day your vital information could disappear. In fact, your entire identity could, as you have no control over it. We very much believe in posting some unique, native content to social media. But it’s still with the intent of getting prospects back to our website and blog where we have infinitely more information, offers and complete control over our brand. We do, however, believe in a concerted and harmonious effort between our blog and various social media channels. • They host your videos for you. You donít have to pay for the expense of hosting these gigantic files yourself. • And… theyíre owned by Google! Needless to say, YouTube videos give you the best SEO kick of any social media channels. At Edwards Communications, we create about 30 Happy Hour Recap videos per year. That’s a lot of megabytes of video… and a lot of SEO juice. We feed the videos into our blog and add summary transcripts (again, for SEO… as Google can’t rank what is being said within the video content… yet). We also tease free content and important links to content on our YouTube page in order to lead some of the traffic back to our site. Once on our blog page, we again stress the advantages of signing up for one of our lists (free premium content, right to your email box). Now at the blog, an interested prospect can scan your archives, About Us page and other offerings to qualify themselves. If this interested prospect sees the value of your content and joins your all-important list, they just took a valuable first step to potentially converting to a client. At the very least, they may become evangelists for your services. Put your social media to work for your blog: LinkedIn, Pinterest, Facebook, Twitter. We see value in various audiences across so many social media channels and it would be incredibly taxing for us to post to our blog and then craft individual posts for all our favorite SMs on a regular basis. We put a lot of time into crafting our all-important content, so we need to post it efficiently, but with maximum impact. For this reason, we use the premium WordPress plugin, Social Network Auto Poster (SNAP). It takes a little doing setting up the social networks optimally, and it honestly does need updating quite a bit as the SM channels are updating all the time. But the payback is considerable. One post to our blog automatically posts to all of our preferred networks with links leading back to our site. Additionally, we created an automatic eNewsletter for our a Slice a Day with Mark Tennant subscribers. This is a great value of time and effort and the list of prospects that you build is the most valuable part of your marketing effort. I do a lot of blog consulting. Earlier on, I found it frustrating to build clients websites and blogs, train them in blogging and copy writing techniques, and then see them abandon their efforts before they really even got started. Why do most companies (I read a HubSpot article in 2013 that claimed 90%) abandon their content marketing plans so quickly? 1. Because they don’t truly have a PLAN. Most companies will put together a schedule of their intended posts, but not have a plan for putting together the content. Other companies will put together (or have) a considerable amount of good content, but not invest the resources into implementing it in ways I discussed in the last section. 2. Expecting immediate gratification. You know what I mean here. You forced yourself to create 2 blog posts over 2 weeks, and you kept checking back waiting for the comments to start building up. You got no gratification, so you gave up… or your boss played that role. My partner, Mark Tennant is our CM Plan guru, and he’s discussed it in our Happy Hour Recaps in more detail than I will go into here. But I’ll tell you that this PLAN is the blueprint for the SUCCESS of your inbound marketing campaign. The absence of it is its FAILURE. I realize that not every company has the human resources at their disposal to implement all the above with consistency. But a blog can still be a valuable source of information for your potential customers. It can supply the SEO needed in order for them to find it and finally, it can be the repository of information required to convince your prospects that you are an expert in your field. In our next section, weíll discuss even more ways to use your blog (and always building valuable SEO in the process), but I think itís important to put Case Histories in a category all its own, as it is a bare minimum that any one man (or woman) business can and should deploy. It doesnít require a lot of time, nor special writing skills, but it will build the most valuable, searchable content that your site should have while also providing your interested prospects with the reinforcement they need that you provide an excellent solution with your product or service. Each Friday, end your week by posting a few paragraphs about the most interesting service that you provided or product that you sold. Include important information such as location, products used, unique applications and benefits to the user. This is for SEO. Clearly, the above criteria can fit into the busiest schedule especially if you consider that you can create this post on a smart phone using the WordPress app while sipping a happy hour beer. The “important information” bullet above is the key to building really great long-tail keywords that will get you found for specific searches. For instance, if youíre a landscaper and you posted a blog about a new organic weed killer that you used on a lawn AND you mentioned where that lawn is, then someone else in that area doing a search such as, “SameCity, SpecificOrganicLawnSolution” would probably find you at the top of the search page. As a subscriber to Happy Hour Recap, you get this chapter of our upcoming eBook free in our eNewsletter emails. Your blog should be looked upon as much more than a section of your website where you fruitlessly agonize over what clever article to write only to have no one comment on it. As we just discussed, one of the main things a blog is necessary for is to build your SEO so people can find you. This alone makes it a big part of your marketing efforts, but ENGAGING your audience is equally important and here are some other methods to consider. Join Happy Hour Recap and get this chapter free along with our videos right in your email box. I’ll go over the 5 blog uses listed below, and my recommendations of plugins to use. The point to this section is to show businesses how to make their blogs “Websites that Work” as we say at Edwards Communications. Any unique use that you can think of will increase your SEO and provide your prospects with up to date information that wins their trust. And as we saw with the Forums suggestion, you can save valuable man hours using your blog as a powerful FAQ resource.